Hello lovelies, I am going to share with you my personal list of skincare essentials that I must have these days. I will break the post into a few parts so that its not too long to read. The weather in Singapore has been hot and humid, as well as rather unpredictable these couple of weeks with heavy rain in one moment, and scorching heat the next. Methinks the temperature can go as high at 34 or 35 degrees celsius? Anyway, not the best time to bathe in the sun these days. Everyone who wants to have good skin knows that cleansing our facial skin is very important step of our daily skincare regime. If I am wearing makeup, I will first use a mild makeup remover to remove the cosmetics (ie Sephora’s Triple Action Cleansing Water or Bioderma Sensibio Micellar Water). The makeup remover will take away the facial oils that has surfaced as well as the compounds of our foundation etc that is left after a long day. Once that is done, I will wash my face with my favourite amino acid based cleanser, Shiseido’s Senka Perfect Whip Foam which foams up into such fine bubbles that could clean the pores more effectively, together with my trusty Clarisonic. Rinse off after 1 min on Clarisonic, and you’ll have that smooth skin that feels so clean! Some may find such cleansers to be drying but for combination skin (normal to oily), it worked wonderfully and I have been using it for the last 3 years! What about your cleansing routine? Did it help you address your skincare concerns? I have written about Senka Cleaning Oil the last round. Now I am going to share my experience on the use of Senka’s Perfect Whip Foam, which comes from the same Senka product family, under Shiseido. Visually, this product is like any other facial foam. Comes in a light blue tube, the product dispensed is white and creamy. The uniqueness of this product is that once you rub the product with cold water, it will create lots of foam, which looks like a well beaten egg white. Take some practice actually. If you like to use warm water to wash your face, take note that the product may not fluff up as much. According to the product explanation, the foams created are finer and could clean the pores more thoroughly. It was also mentioned on the product that Amino Acid is one of the ingredients included. Those who have acne or problem skin will appreciate that Amino Acid cleansers are good for problem skin. I use the Perfect Whip Foam twice a day, Day and Night. Personally, I find the Perfect Whip Foam not too drying (though I have found out from others who find it a bit drying after wash), and give a little bit of hydrating effect. At night, after removing my foundation or sunscreen with Sephora Triple Cleansing Water or Bioderma Sensibio, I will use the Perfect Whip Foam with my Clarisonic Aria on normal speed. This helps to cleanse my skin once and for all to prevent clogging. This method has worked well for me thus far. Squeeze your usual amount of foam cleanser (it should not be more than 2cm long product as it will be too much), and foam it up using cool or room temperature water. Once that is done, spread the foam on your face with light rubbing motion. Then give your Clarisonic a quick rinse, flick off the water and turn it on and place the brush starting from the center of your forehead and move in circular motion. The entire brushing time should only take a minute. Then rinse your face with warm water (esp if your face is very oily) followed by cool water. Some people will rinse with cold water to immediately close the pores. I don’t particularly find this making much of difference for me, but I usually would prefer to use warm water only. You will find that your skin is smooth and clean. Do remember to keep your Clarisonic brush head clean by detaching it from the handheld, and run it under warm water to remove suds, followed by flicking off remain water and leave it to dry. 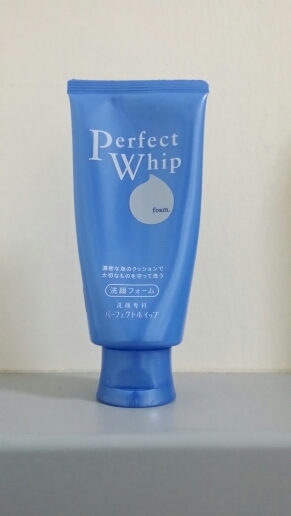 If you live in Singapore, you should be able to purchase Senka Perfect Whip Foam from Watsons, its retailing at around $12 per tube (I think). Frequent users can always purchase them when there is a sale at Watsons at a cheaper price. Like many skin care and food products, Senka is a Japanese product, but they do let regional partners help them manufacture the products using the same formula. So, not all Senka sold in the market are made in Japan. 1) From Qoo10, you will find many sellers carrying this product. I like to visit the vendor Kenko.com who claimed that they import directly from Japan. There are of course other sellers who could prove that their products have gone through checks by Health Sciences Authority of Singapore. These are reliable products too. Just take note of the expiry dates before you buy. You will notice that products imported from Taiwan comes with chinese labels at the top of the tube. Those from Japan or Korea comes with Japanese labels at the top of the tube. 2) From Rakuten, you can also find Kenko.com to make your purchase. But of course, from Rakuten Japan website, you can find the Japanese locals carrying the same products but it could be pricier to import from there. 3) If you are shopping from Japan and you are able to read Japanese, you can visit Kenko to place your online order too. This facial cleansing oil is one not to be missed if you are looking for a lightweight facial cleansing oil that can be used on wet or dry skin. According to english speaking sites, this is a makeup remover that is free of paraben and can be used for normal, oily or combination skin. I do not put on heavy makeup usually so I cannot attest to the claim that it removes heavy makeup when applied on dry skin using dry hands. This product is not too difficult to emulsify when get in touch with water. The texture of this cleanser is clear and very watery, and it comes with a scent that reminds you of fresh green apples! My skin is sensitive and acne prone but it did not cause me any breakouts after I had used it (ie does not leave residue that clogs my pores). My skin also feels hydrated after cleansing (ie before using facial foam). One reminder for using this, is if you are using facial foam to wash your face as a two-step cleansing (I don’t think its really necessary to do a two-step cleanse), please do not use clarisonic with your facial foam because you may find your skin feeling taut or dry after wash (ie over cleansing). For those who are sensitive to mineral oils, you might want to give this a miss because it is one of the ingredients. This product is part of the Shiseido Senka family so if you like to try a facial oil that is lightweight cleansing oil and can take away light makeup or sunscreen thats left on your face, this is the one! You can get it from any Watsons in Singapore. This is my new acquisiton after searching high and low for a lotion that could restore hydration to my skin. I may be living in a tropical country, but working in an airconditioned office environment is drying my skin. My skin condition suffers even more when I am overly busy with work and forgot to drink water! 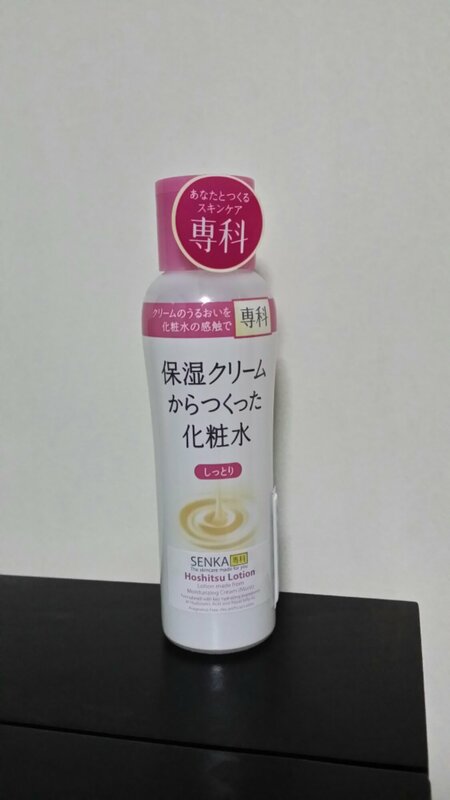 Senka (专科) is one of the off the shelves skincare product by Shiseido catered to return hydration to the skin. Packed with double hyaluronic acid and Royal Jelly extract, this lotion is watery and does not give a sticky feeling after applying on the skin. Having tried Hada Labo myself, I definitely prefer this over Hada Labo for the after use feel and texture. Lotion absorbs quickly into skin and I even tried using it like a massage mask! Put about a 50 cent coin size worth of lotion onto your hand after washing and drying your skin. Apply the lotion onto your skin generously and massage your face starting from your forehead (gently in circular motion) before gliding your fingers from your temples over the top of your cheeks to reach the bridge of your nose between your eyes. Gently run your fingers above your eye brows, down to your temples, over the top of the cheeks and end at the bridge of your nose. Glide your fingers on both sides of your nose to press a finger on each side of your nostrils for 3 seconds. Glide up between your eyes and press gently both side of the bridge between ur eyes for 3 seconds. Then move your fingers to press gently under the peaks of both the cheekbones for 3 seconds. Move the fingers to about 1 cm away from both corners of your mouth and press gently for 3 seconds before moving a finger to press under the center of the lower lip for the last 3 seconds. You can do this as many times as you like. Once u are done, gently pat the remaining lotion on your face avoiding the eyes. Tissue off lightly to remove any remnants of the lotion and go to sleep. As I am using the Perfect Whip Foam (same product family) to cleanse my face, I can jump to use this lotion thereafter with or without toner. I have tried using this lotion with my Albion Skin Conditioner and I notice that my skin absorbs better than when it is without toner.